Genetics Genetic Testing Urged to Identify Potential Ovarian-Cancer Risk Continued from cover Women with personal or family histories of ovarian cancer in first- or second-degree relatives are encouraged to seek genetic counseling and testing, says Erin O’Leary, a certified genetic counselor with UCLA’s Jonsson Comprehensive Cancer Center. Also, women with strong family histories of breast cancer, especially breast cancer at young ages, or in male relatives, may benefit from testing. For women who have already been diagnosed, the testing can pinpoint the potential genetic cause so that family members can be tested for the same mutation to determine their risk for developing cancer and to make informed, proactive and preventative medical-management decisions. 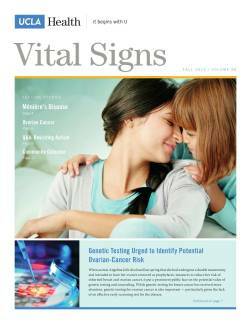 For healthy women who are seeking counseling and testing because of a family history, a number of genetic factors known to predispose women to ovarian cancer are considered. The most 1 out of 71 women will develop ovarian cancer in her lifetime. UCLAHEALTH.ORG 1-800-UCLA-MD1 (1-800-825-2631) common are BRCA1 (the mutation for which Jolie tested positive) and BRCA2, which can increase a woman’s lifetime risk for breast cancer to approximately 60 to 85 percent and for ovarian cancer to 15 to 40 percent. But O’Leary notes that ovarian-cancer risk is also tied to hereditary colon cancer and other genetic syndromes, and roughly 10 percent of patients who test negative for the BRCA mutation but have a strong family history will have a mutation in another gene associated with the disease. Because as many as half of early stage, treatable ovarian cancers are not detected even by the most vigilant screening efforts, experts recommend that when testing indicates a woman is at a markedly high risk for ovarian cancer, she take preventative measures — removal of the ovaries and fallopian tubes after completing childbearing, ideally by the age of 40. Every 24 minutes marks another diagnosis of ovarian cancer in the United States. For the last several decades, the prognosis for ovarian cancer has remained largely unchanged. Efforts to detect the disease while it is still at an early, treatable stage continue to prove elusive, and little progress has been made in developing effective therapies. Now leading researchers in the field, including a group at UCLA, suspect they know why: they’ve been looking in the wrong place. “We’re learning that the most common and aggressive type of ovarian cancers, called serous tumors, originate not in the ovary but in the neighboring organ, the fallopian tube,” says Sanaz Memarzadeh, MD, PhD, a UCLA gynecologic oncologist and researcher. Much of the investigative effort is now focused on understanding the cells within which the tumors originate, which can lead to better biomarkers for early detection of disease. Dr. Memarzadeh and her colleagues recently identified a population of stem-like cells in a human fallopian tube. Guided by the profile of these cells, they are starting to isolate the most aggressive and regenerative cancer cells in human serous tumors, with the goal of targeting them for therapy.